An asteroid has been detected whose path, based on some recent observations, appears to originally originate beyond the Solar System. Which makes it to be the first visitor of this sort we have ever observed in all recorded history. Its approach direction even hints it might have come from Vega. Vega is one of the closest, and most famous, stars beyond our Sun. A/2017 U1 made its closest approach to the Sun on September 9. We failed to see it on the way in, partly because of its path of approach, but also because it is just an estimated 160 meters (525 feet) across. However, when it was seen on October 18, observers using the PANSTARRS 1 telescope in Hawaii noticed something very odd about its orbit. A statement by the Minor Planet Center calls urgently for more observations since an orbit plotted on just six day's data is unreliable, but noted that based on the data we have; “This object may be the first clear case of an interstellar comet.” After subsequent observations showed no cometary activity, the object initially thought to be a comet was declared an asteroid. Along with the short and long period comets we observe frequently, astronomers expect to see a third type: interstellar comets whose orbits are hyperbolic, rather than elliptical, meaning they will pass the Sun just once. These would have formed along with another star, but be thrown out of its orbit through an encounter with that star's planets, left to wander the galaxy like our own space probes. Oort cloud comets can also have hyperbolic orbits, defined by an eccentricity greater than or equal to one. To be likely to have originated outside the Solar System, a comet needs to have an eccentricity well over one. 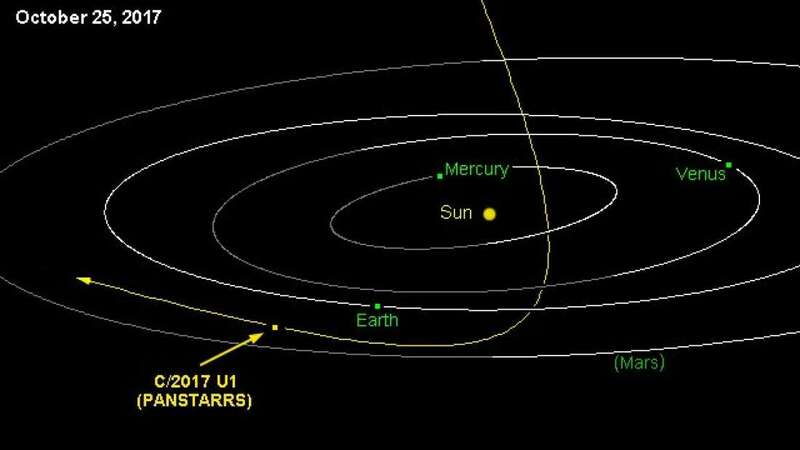 A/2017 U1 is estimated to come in at 1.19, contrasting with most known hyperbolic comets which had figures of less than 1.01. Only one candidate for an interstellar visitor has been spotted before, and its eccentricity of 1.05 is attributed to a close encounter with Jupiter. We anticipated visiting objects from other stars would be icy comets, producing comas and tails as their ices melt. Consequently, when the orbit was first calculated the object was named C/2017 U1. However, as further observations revealed no trace of cometary activity, the C was changed to an A, indicating asteroid status. The difference is important, as it suggests A/2017 U1 formed within the frost line of whatever star system it came from, making it particularly intriguing as its orbit could change sufficiently to throw it into the great beyond. The incoming path was calculated as being from the direction of Lyra, although not quite in line with alpha Lyrae, better known as the much-loved Vega, star of Carl Sagan's Contact.